Let’s get this clear: I’m not a musician. I can play the piano a little bit, and I can sight-read music a little bit, but my musical education ended when I was in my early teens. Over the years, I’ve noodled around a little bit in the musical corners of GarageBand on the Mac. But never have I had the fun I had in the hours I spent playing with the new $5 GarageBand for iPad. Now, the tactile thing: to use GarageBand on the Mac, you have to use a mouse or (if you’re really cool) a USB keyboard or a guitar with a fancy input. Playing keys with a virtual keyboard is unfulfilling. 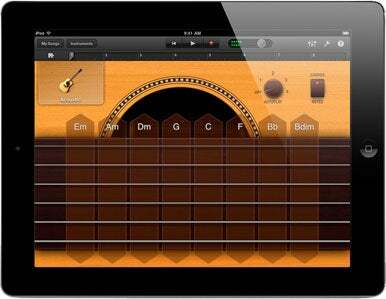 Tapping out chords on an iPad screen, and running your fingers over virtual guitar strings? Fun. It’s that simple. The options GarageBand for iPad offers are broad. You can record tracks as Keyboard, Drums, Smart Drums, Smart Bass, Smart Keyboard, Smart Guitar, Guitar Amp, Audio Recorder, and Sampler. Keyboard is what you’d expect, a virtual keyboard similar to those seen in other iPad apps (though with some nice customization features). Drums is a virtual drum kit you can bang around in, with a remarkable variation in sounds depending on where you hit the drums. The Smart instruments are all training-wheel versions of the real thing, and a lot of fun to use. Guitar Amp lets you plug in a guitar and start playing. Audio Recorder lets you record anything via a microphone (the iPad’s own, or one you attach via USB). Sampler lets you sample anything—your dog, a belch, your garage-door opener—and turn it into a playable sound. Getting audio out of GarageBand when you’re done is easy. First is easiest: just e-mail a song. The app creates an AAC file and attaches it to an e-mail, just like that. You can also save an AAC file to your iPad’s shared space, so you can drag it out of iTunes later. You can also save your project to iTunes as a GarageBand project file, which you can connect to a Mac and drag out, then open in GarageBand for Mac. I wasn’t able to test this feature, however, because it requires a GarageBand for Mac update that hadn’t yet been released. So the exporting thing’s handled, but the one thing GarageBand can’t seem to do is import anything. I wish there was a way to copy in an audio file and add it to a track. This would be a big boon for those of us who like to use GarageBand for podcasting, and while I accept that GarageBand is a musical tool first and a spoken-word tool second, it sure would be cool to be able to produce an entire podcast using GarageBand for iPad. (Presumably some musicians wouldn’t mind bringing in a background track of their own, too?) Maybe in a future update. But my quibbles are minor. The fact is, you will never get more for your $5 than by buying a copy of GarageBand for iPad. And since it’s compatible with the first-generation iPad as well, the wait need not be long. Unless you’ve never enjoyed music in your entire life, you should buy GarageBand for iPad the moment it hits the App Store. Stay tuned: my little journey into musical incompetence is just the beginning. 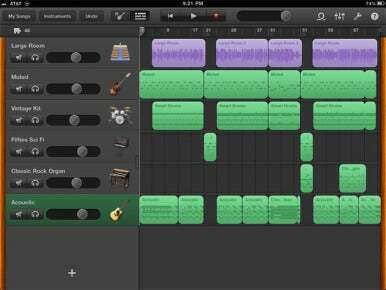 We'll have much more about GarageBand for the iPad in the very near future at Macworld.com.